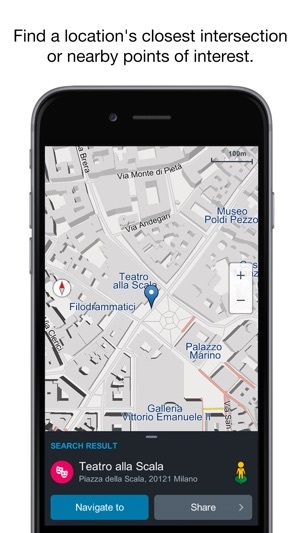 Genius Maps is a free application that installs on your iPhone and iPad. 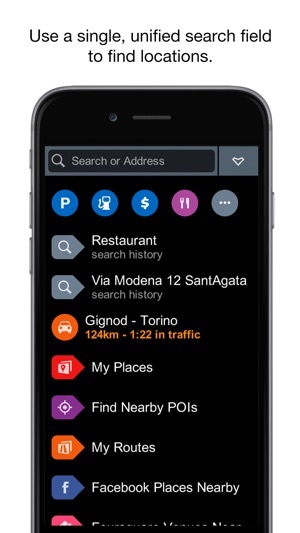 It's an offline route planning, exploration and navigation app that doesn't require a mobile internet connection to search and navigate. 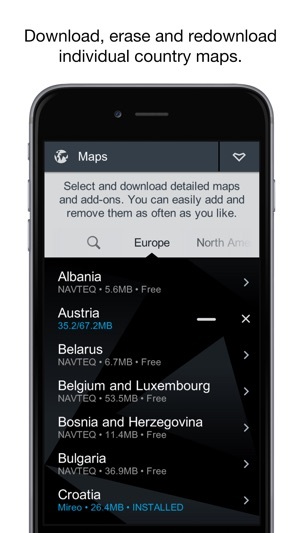 All the maps are stored on your device, so there are no roaming costs and your battery lasts longer. Genius Maps offers a free 7 day trial with fully-functional Pro Guidance and Live Traffic that can be activated at any time. Choose to upgrade to Pro Guidance and Live Traffic during or after the trial or simply continue using the free professional-grade maps for planning routes and exploring with the pedestrian navigation at no cost. 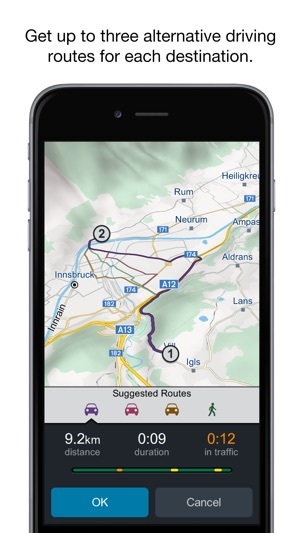 GENIUS MAPS IMPROVES HOW WE EXPLORE AND NAVIGATE OUR PLANET'S ROADS WITH OUR SMART DEVICES. 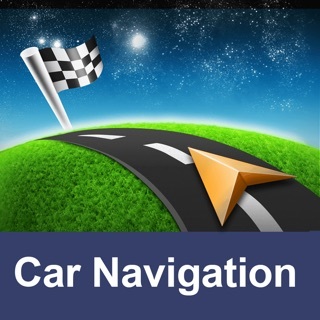 PROFESSIONAL NAVIGATION MAPS CAN BE DOWNLOADED FREELY, REMOVED AND REDOWNLOADED AS OFTEN AS YOU WANT EVEN AFTER COMPLETING THE TRIAL. 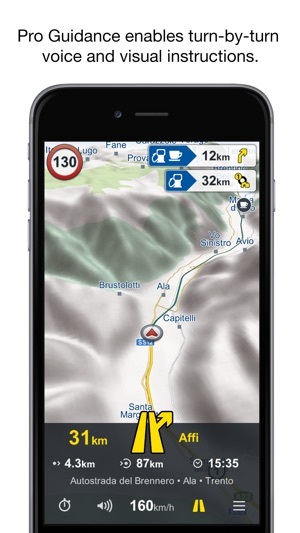 GENIUS MAPS' RICH FEATURE SET EQUALS AND EXCEEDS THOSE OF PROFESSIONAL NAVIGATION SYSTEMS. PRO GUIDANCE enables turn-by-turn voice instructions in your language, automatic rerouting, speed limit alerts, POI along the route and unlimited map updates for a selected region. Pro Guidance is a paid option with a lifetime license for the selected region. LIVE TRAFFIC lets you know about congestion, road works and accidents and reroutes your trip automatically. Instantly view realtime traffic info and adjusted travel times on multiple saved routes. Live Traffic is a paid option with a lifetime license for a selected region and it requires a mobile internet connection. SAFETY CAMERAS informs you about approaching safety camera locations so you can be more alert to your surroundings and drive safer. Safety Cameras is a paid option with a lifetime license for a selected country or region. Please check under Settings in the Genius Maps app for pricing and availability of Pro Guidance and Live Traffic. Go to Manage Maps and select a country map to check the availability of Safety Cameras. Unlimited map updates for PRO GUIDANCE users are available without additional charge and for as long as the product is supported. Coverage and feature support in the map will continue to match the original version, as long as the original is commercially available. Lifetime license refers to useful life of the device and means the period of time that Mireo continues to support the app with updates. Genius Maps Puts The World in Your Pocket! Note: Continued use of any GPS application running in the background can significantly decrease battery life. We strongly suggest using a charger while using the app in your car. Most GPS devices have greatly improved the voice problem. Genius Maps is so new but so backwards. I see that I need to turn onto “whatever Dr” but what I hear is “whatever doctor” Needs a LOT of improvements to get up to speed. NEW - It’s been updated, now I hear “whatever Dee Are”. Also I see gas stations on the map, but what about the restaurants and hotels and shops and schools etc. Also it would be nice to set the alerts and not have to set them every time I use the app. I don’t need to hear that I’m going over the speed limit. I don’t need to be told there are gas stations close by ever second. It would be nice to turn them off and not have to keep turning them off every time I use the app. I notice since the last few updates that the pro guidance sometimes tell me to exit the highway only to immediately tells me to get back on the highway again. The voice has trouble with many street names having to spell the names instead of speaking them. I want to see a button on the main map that allows me to quickly change route options such as “avoid toll roads” instead of having to go through a lot of menus to do this. I do like the pro guidance correctly telling which lane to be in to keep the correct route.